The photograph you see above is stumping NASA researchers. Just as the agency continues to pursue whether or not Mars once—or currently does—contain water, it looks as though there are deeper mysteries worth exploring. The picture was shared by NASA Mars Exploration Rover lead scientist, Steve Squyres, during an event celebrating the ten year anniversary of the agency's twin rovers, Spirit and Opportunity, since landing on the red planet in 2004. The strange rock was described as about the size of a donut, and is stumping scientists as to where it came from. 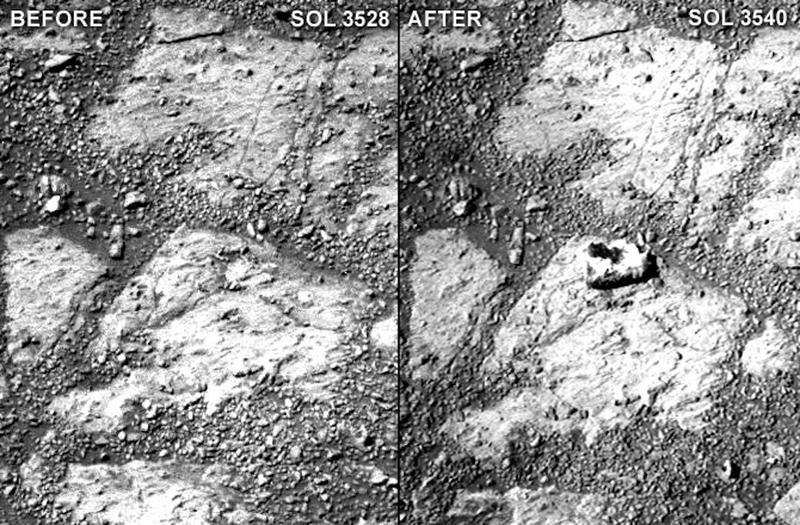 The photo on the left was taken from sol 3528, while the photo on the right, with the donut rock, shows up in sol 3540. NASA has found everything from suspected gypsum on Mars to possible clays formed during the planet's past, though the rock sighting is what is really piquing researcher interest. There are one of two theories: either NASA's Opportunity rover managed to flip up the object while maneuvering on Mars's surface, or it's the result of a nearby meteorite impact event. Squyres blames Opportunity for the rock's sudden appearance, though he does admit he's just guessing. Apparently, the Opportunity's front right steering actuator is out of commission, which could have somehow dislodged the rock and caused it to land in the position you see above. But while the explanation of how the rock got there might be easily guessed, scientists are using this as an opportunity to study it. Apparently the rock is "upside down," showing a side that "hasn't seen the Martian atmosphere in billions of years." That gives scientists the opportunity to investigate and see what secrets lie within. Maybe the most interesting part of this whole thing is Opportunity itself. The rover was initially sent to Mars for a 3-month primary mission, but it's still ticking ten years later. According to Space.com, the rover has racked up 23 miles on its odometer thus far, with no signs of slowing down. Opportunity's sister rover, Spirit, succumbed to the Martian elements back in 2009, when it got stuck in a sand trap in Gusev Crater, and eventually stopped transmitting in 2010. Squyres said the team is still investigating how the rock got there.